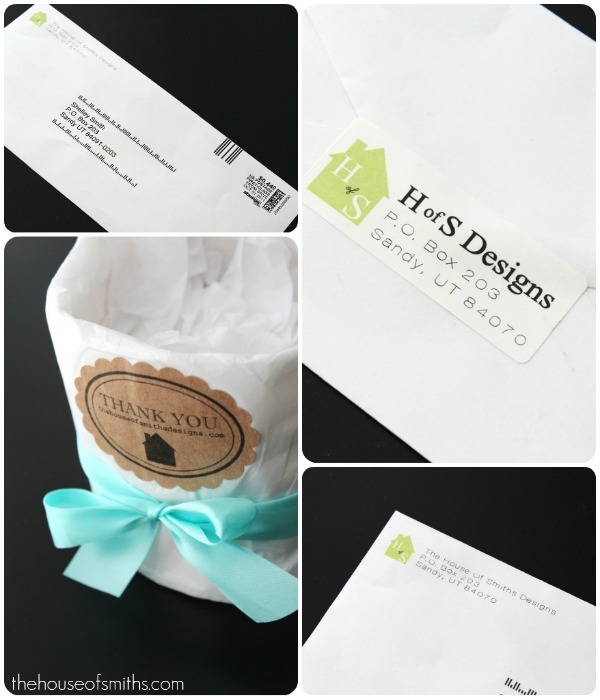 H of S Designs Packaging and Thank You! It really means so much to us, more then you know. On another note, we have finally finished designing our shop packaging. yay! We'll be mailing out our first orders on Monday and we're ready to go! We've also been entertaining the idea of carrying a few other fun items in our shop for our customers that may include small pieces of limited time handmade furniture, frames, knobs, pillows...etc. All "House of Smiths style". Designed by yours truly, and most pieces built by our in-house master carpenter and handyman (aka: my Dad) ha! We hope that everyone is having a relaxing afternoon, filled with lots of quality time with family. I'm super impressed with your entire launch. It is super snobby to admit this, but I don't give out praise freely- my aesthetic includes a sophisticated, whimsical (I know, it seems at odds) with extreme attention to detail (sadly this only applies to my artwork and not my housework;) oh….well….) This causes problems at home (heehee), but also when I leave comments on blogs. I can't stand when the little things are neglected. You have done a great job with not only the expansion of the business, but also how well you thought through even expanding it and how well you communicated that information in the previous blog post. Now, you add charming packaging and it is the icing on the cake. Great job and I wish you great luck. I have a Cricut and have yet to cut one pieces of Vinyl but seeing your projects makes me want place an order. Your designs are adorable. Oh my goodness I would love "House of Smiths" style items in your shop!! I love everything you do!! Congrats on the new shop! Your packaging is gorgeous! Yay! I am SO excited to get my order! Love it! Awesome! And crangrats as well as good luck! How fun! I can't wait to see what items you add to your shop! I absolutely LOVE everything you guys do. In fact, we just made "our version" of your bead board wall. Quick question too. Where did you find your yellow lights in your living room? I'm not sure what style I want, but I'm also not sure where to start looking. Hi, Congrats on your shop! Cute stuff! I was wondering if you could make a tree. Like a big tree. I've been looking for one for months and I can't find one that I like. I just wondered and good luck with your new shop! Yay for you, Shelley! Your stuff is fabulous, and I'm inspired every time I check your blog. I was wondering if you'd do me the HUGEST favor and email me the font you use for the 'taking it one space at a time' in your header. I'm working on a project for my little boy's room, and it's perfect for the project. If you have a second, my email is lindsay.h.roberts@gmail.com. I'd appreciate it so so so much. Thank you thank you thank you! I love that you put "Thank You" on your packaging. I am always put off when I order things from etsy, and the person doesn't bother saying thanks. One of the reasons I choose etsy (and stores like yours) is because they have that personal touch and it's buying directly from the person doing the work. That touch is lost when they omit a quick note of thanks, handwritten, pre-done, or whatever works.